Anyone having a bumper crop of tomatoes? Got a LOT of green tomatoes and hoping I get to harvest them red and fresh, but who knows...one person's garden just south of here has already frozen once this year. We actually just picked our first two red ripe tomatoes a few hours ago...a few others are blushing at the moment, so soon. We'll see how the weather cooperates, suppose to be nice and cooler the next week or so, AND no freezing in the forecast. Oh God yes I have canned pizza sauce, tomato soup, salsa, we have made and canned tomato juice and stewed tomatoes. We are at the point now where we are just giving them away! 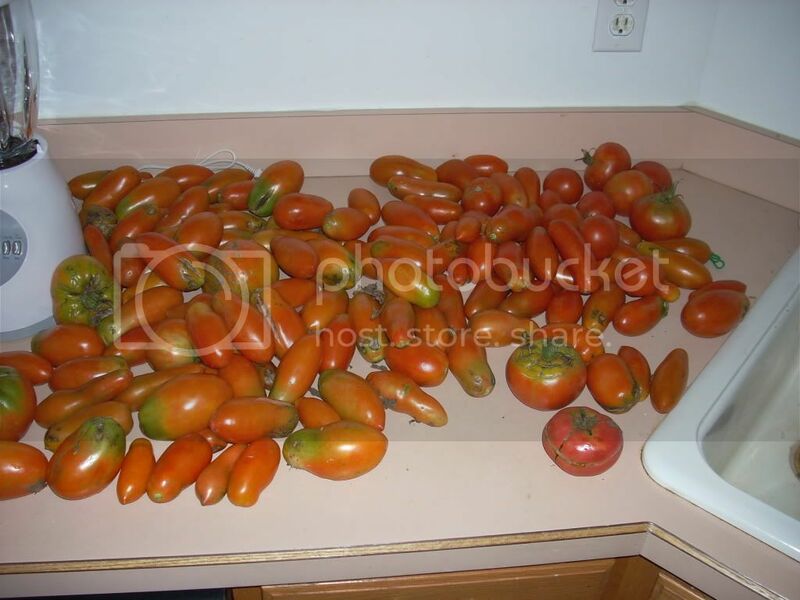 I have 7 plants right now that are just covered with tomatoes. One of them I got from my Aunt in IN that grows tomatoes bigger than softballs. It has 60 on it right now all green and as big as hardballs. When they turn red I plan on making a big batch of tomato soup to can and that should be all the canning I do this year. I wonder if those two differences had anything to do with the tomatoes' performance this year. Applestar--you can do comparison growing next year, some like your standard method, some varying. Of course, then there's that variable of weather we can't control. Still it would be interesting. Been one of the best years that I can remember, Sad to say that with so many in major drought conditions. So far I've been able to freeze close to 10 gallon size bags of cored tomatoes, 6 quart jars of sauce. 12 pint size jars of stewed tomatoes, 4 plastic containers of salsa, 2 quart jars of dehydrated. And I still have more on the vines and ripening in the house.. and we"ve given lots away to friends that didn't have as much luck with their gardens. I am still picking San Marzanos by the bucket load. 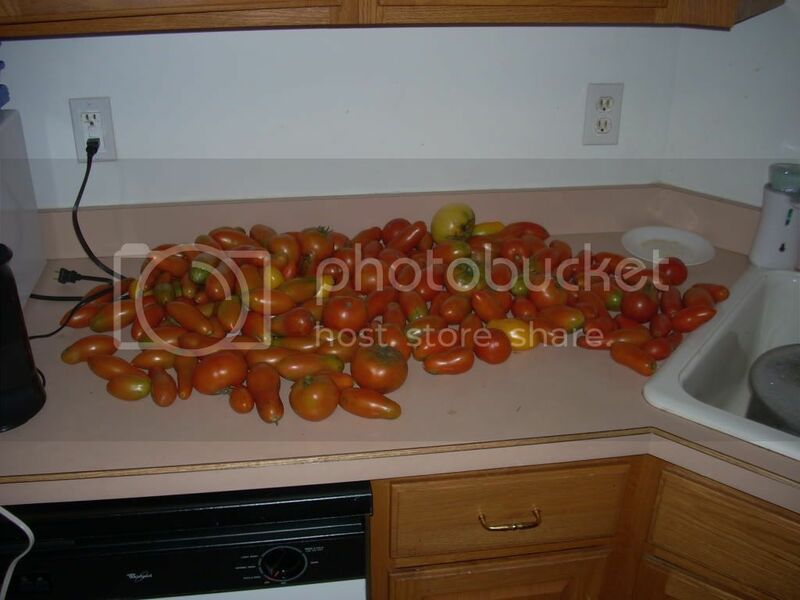 Wow, I can't believe how many tomatoes I am getting. I just picked 8 more gallons, mostly San Marzanos and a few unidentified heirloom varieties that are carbon copies of each other. I've been cooking up sauce every other night. I wish I knew what this other tomato was. It's a keeper whatever it is. The only other tomato I've grown that is so perfect and crack free is the rutgers, which I used to make sauce from but don't have too much use for since I found the San Marzanos. I've made pizza sauce, spaghetti sauce, meatball sauce and barbecue sauce. I'm quickly running out of room in my small stand up chest freezer. With the price of food going up almost 20% in the last 4 years, it's silly not to grow what you need if you have the room. Marydel...great looking tomatoes. Sounds like u have been busy in a fun sort of way. Your lab makes me miss our Gabby, a true tomato lover herself! Marlingardener wrote: Well Marydel, I envy you both your tomato harvest, and your 90 lbs. of loving puppy! I haven't had any luck with San Marzanos, but your photos and descriptions have inspired me to try them again next season. Do you have any hints/advice for someone who really really wants paste tomatoes? I have found that SMs don't like the heat. Unlike other tomatoes they will actually still set fruit when it's hot but then they start rotting when about 2" long and fall off. In Texas you may be out of luck, but you could try shade cloth or plant them in a partially shaded area to try to keep them cool, or maybe plant them later in the summer for a fall crop. There may also be some other paste varieties that tolerate heat better. I'm just a beginner at growing paste tomatoes. Still getting tons of San Marzanos off my plants. I've canned about 70 quarts whole, 11 pints of prepared sauce and have frozen about a gallon of prepared sauce. I'm just wondering when they're going to give up, as I have seedlings that will be ready for the spot in the near future! Mine were horrible this year. They just grew soooo slow and most of the buds never set fruit. The only variety I had was yellow pear. I got about 15 fruits. About a week ago I decided it wasn't worth the space anymore so I chopped it up and threw it in my compost. Thomas CA wrote: Still getting tons of San Marzanos off my plants. I've canned about 70 quarts whole, 11 pints of prepared sauce and have frozen about a gallon of prepared sauce. Best tomato soup you will ever eat! Just add milk or cream when you prepare it to eat. Combine all ingredients and heat. Melt 1 pound butter in saucepan. Remove from heat and add 2 cups of flour with added juice for a smooth blend. Mix into juice, stirring as it comes to a boil. Pour into jars. Process quarts 30 minutes, pints 15 minutes in hot water bath. Makes 20 to 21 pints a recipe. I've had quite a nice harvest this year. Things really slowed down in late-July/August due to the heat, but I'm getting a nice late crop coming in now. With about 45 days of growing season (on average) left, I should be pulling them in for quite a while longer. Educated guess would put my total haul at well over 100 lbs. from my ten plants (two SMs, one ridiculous volunteer Roma, two Brandywines, two Cherokee Purples, two Valencias, and one Mortgage Lifter). I've made a total of ten pints of salsa and many sauces, and I've been coring/seeding and freezing the rest for use this coming winter and spring. The big problem I've had is that in the last month or so, I've had a lot of tomatoes with splits and cracks that haven't been ripening very well around the blemishes. And my paste tomatoes have recently not been fully ripening on the tops - probably the top 1/4 or so have been wrinkling up and not ripening thoroughly. I didn't have either problem earlier in the season. It's not a huge issue, but I do lose quite a bit to my compost bin because of it. Triple L Crop Tomatoes - Looking for as much info as I can! Crop pictures, Purple Russian Tomatoes..